Dr. Rory Cooper, who was once with our Biomedical Engineering program, received his PhD Degree from the University of California, Santa Barbara. Rory had previously served in the United States military and, while serving in Germany, suffered a spinal cord injury, causing paralysis and confining him to a wheelchair. The injury affected his mobility, but not his enthusiasm, as demonstrated by his major accomplishments. Rory was recruited by Sacramento State University and served as a faculty member in the College's Biomedical Engineering Program. 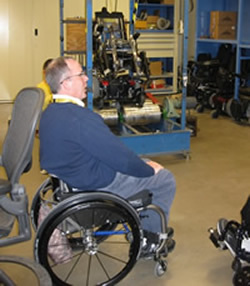 He understood first hand the benefits that technological advancements in robotics can have on the daily lives of individuals with such physical disabilities. Many of his research accomplishments were published in major publications, making him an expert in this critical field of study, where he has become internationally known . Because his research was beyond the scope of Biomedical Engineering research at Sacramento State, I, as Dean, recommended that he consider The University of Pittsburgh where, as an alumnus, I was well aware of the research taking place there. Dr. Cooper has made major contributions at the University of Pittsburgh in his role as Distinguished Professor of Rehabilitation Science and Technology and Professor of Bioengineering, Mechanical Engineering, Physical Medicine and Rehab and Orthopedic Surgery. Through his work in partnership with the VA Hospital, Dr, Cooper has made great gains in improving self direction for America's returning veterans. Rory has received numerous awards for his accomplishments, including the International Paralympic Scientific Achievement Award and two Rehabilitative Engineering and Assistive Technology Society Distinguished Service Awards. Recently, The Pittsburgh, Pennsylvania City Council established a Proclamation, declaring June 17th 2014 "Dr. Rory A. Cooper Day". Those of us associated with Sacramento State for most of our caree, can take pride in the role our University played in the career of this outstanding individual. The example he has set for those suffering from physical disabilities should give assurance that being confined to a wheelchair does not prohibit one from making contributions to society. I consider it a privilege to have Rory as a friend and former colleague and take great pleasure in reporting his many accomplishments. Click HERE if you'd like to email Don. If you have difficulty accessing content on this page, please contact the Webmaster, Judy Montgomery.